Something went haywire with Hollywood blockbuster filmmaking during the 1990s, as studios tried to replicate the big spending and star-driven events of the ’80s, but with little of the sense of wonder or fun. The result was a succession of oppressively lead-footed actioners, nostalgia pieces, and family pictures, like Casper, Godzilla, Congo, The Flintstones, Eraser, Volcano, etc., etc.. That’s important context for John Carpenter’s under-appreciated Escape From L.A. As a sequel to one of Carpenter’s best films, Escape From L.A. is a mild letdown. It repeats the basic plot of the original, with a lighter tone, cheaper-looking (yet actually more expensive) special effects, and a now-dated grunge soundtrack. But compared to the forgettable piles of nothing coming out of Hollywood at the time, the movie is… well, Escape From New York. 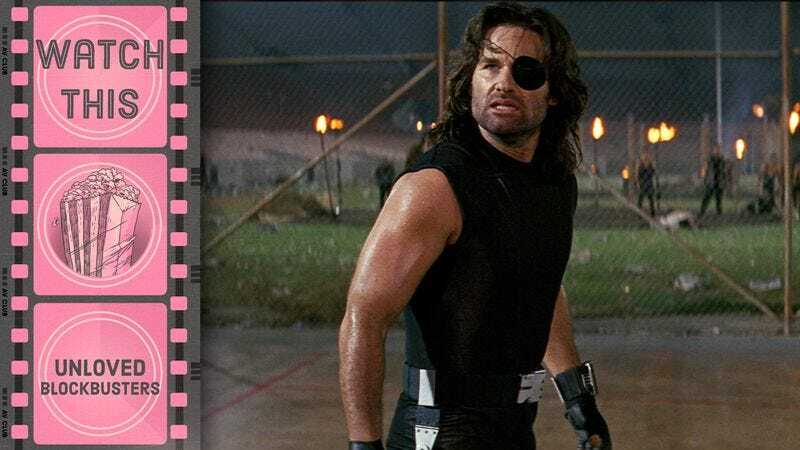 Kurt Russell (who also co-wrote the script with Carpenter and producer Debra Hill) returns as the grunting, ultra-capable soldier of fortune Snake Plissken. After an opening sequence that explains how the Los Angeles of the future has become an island prison, occupied by America’s “undesirables,” Plissken is called in to find and retrieve a doomsday weapon stolen by the ultra-religious President’s rebellious daughter. If he succeeds, he gets a full pardon, and the antidote for a deadly virus that the government’s injected into him. If he fails, he dies—and maybe the world ends. The story’s mainly a slim thread that Carpenter uses to hang a series of over-the-top set-pieces, populated by colorful characters. The cast is practically a who’s-who of “people who were in cool movies in the ’90s.” Steve Buscemi plays a fast-talking hustler, Bruce Campbell is a freaky plastic surgeon, Peter Fonda pops up as a mellow survivalist surfer, Pam Grier’s a transgender mob boss, and so on. Carpenter has a lot of fun with the contrast between Russell’s surly, Clint Eastwood-esque Snake and the parade of kooks he encounters. And the movie finds twisted pleasure in watching Plissken play basketball for his life in the Coliseum, or get into a surf-chase down a flooded L.A. river, or hang-glide from the burning Hollywood sign to a trashed Disneyland. What really stands out about Escape From L.A. today is its prescience. The film’s real villain is a right-wing demagogue (played by Cliff Robertson) who wants to expel and wall-off the people he finds insufficiently American. Carpenter’s satirical angle isn’t as sharp as his They Live, but he is actually trying to say something: about freedom, leadership, and celebrity culture. And as the years go by, Escape From L.A. looks better and better—in part because the crummy effects now come off more as “vintage,” but even moreso because so few bigger-budget action-adventure movies from this era are as lively, impassioned, or angry. Carpenter basically spent $50 million to flip off his industry’s vain nitwits and his country’s hypocritical moralists. He delivered a ragged, righteous, hilarious howl against complacency. Availability: Escape From L.A. is available on Blu-ray and DVD from Netflix, Amazon, and possibly your local video store/library. It can also be rented or purchased through the major digital outlets, and is currently streaming on Netflix.